Ceph scales out, Ceph is highly redundant, Ceph is flexible, Ceph is full of cool features. 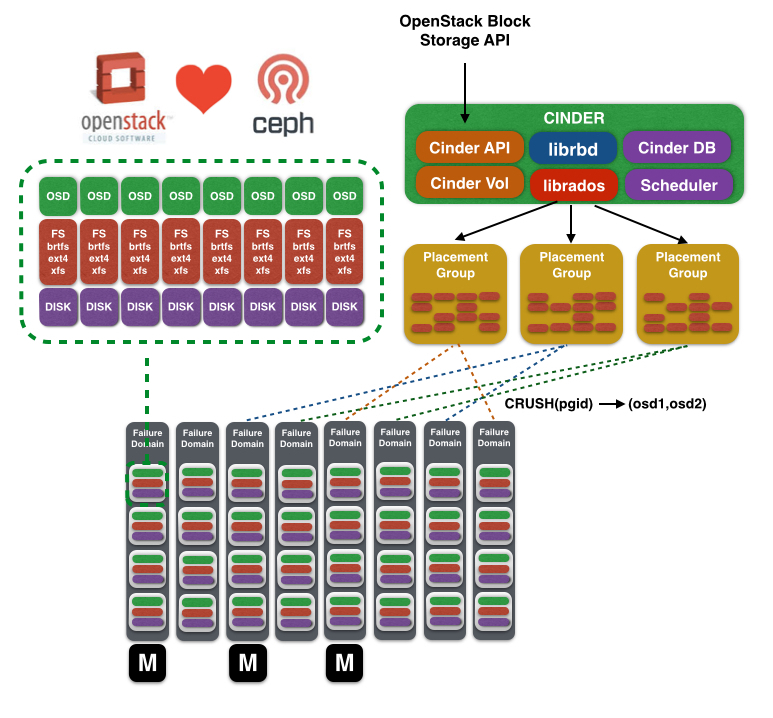 Ceph and #OpenStack are close friends. Firefly is the last Ceph’s release and is a beauty starting point for us to develop what we named “the first storage solution fully supported by KIO”. As I’ve mentioned in my previous notes regarding to this “Software Defined Storage” current reality, commodity is helping out to companies like us to support and design our own hardware storage technology. These new trends are supported by powerful innovators like EMC ScaleIO (or ViPR), Nutanix – BTW, Yesterday I’ve met a high trustable source that told me there is a chance that Nutanix decouples its software from its hardware to get more flexibility and it will be in a very short term – Pivot3 – who dares to say they are the “inventors of Software Defined Storage”- , VMWare Virtual SAN, SimpliVity and more? Much Faster: Ceph is freely-available and that help us to get a more affordable option to use Solid State Disks only to store all Data Blocks at reasonable market prices and removing out the need for Storage Tiering, and therefore a high simplification to manage different applications with different performance needs. Actually, we are adding Flash PCI Cards for caching and making your applications fly like never before! Flexibility: Ceph supports a truly Scale-Out operation model allowing you to add more boxes/servers to increase capacity and performance without any issue to data accessibility. Highly Redundant: You can have up to three copies of the stored data spread among the servers. We were seeing solutions with integration with OpenStack’s Cinder like SolidFire; EMC VNX and NetApp. We’ve chosen Ceph to reach the market prices that our customers demand. SolidFire was pretty close to be selected, but the uncertainty about its efficiency factor and its eventually real results and its dependency from the application data type, make to consider a solution like Ceph that brings a complete accuracy on our storage costs. Ceph is a solution that brings an unified storage solution: objects, block and file access. Ceph’s block storage feature works through a special interface called RBD (RADOS Block Device). Ceph doesn’t work with the traditional storage protocols like Fiber Channel over Ethernet or iSCSI. Anyway, Ceph is optimized to bring a really good performance thank to it “automatically stripes and replicates the data across the cluster“. Then, Ceph thinly provisions any server image into the cluster spreading pieces in different servers and disks (where OSD daemons reside) to balance performance and disk capacity usage. Ceph uses CRUSH algorithm to define where the data needs to be located into the Cluster and it is responsible for the efficiency to scale and balance the usage of the Cluster’s resources. Sounds simple, but you need to dedicate some time to architect and implement it. However, You will not regret to try it! CEPH sounds great on slides. You’d be wise to look deeper though (e.g. the Ceph war stories session at the OpenStack Design Summit… where the term Cephpocalypse was coined). Data loss is generally frowned upon when selecting a storage solution. Love the articles!.. keep em coming!